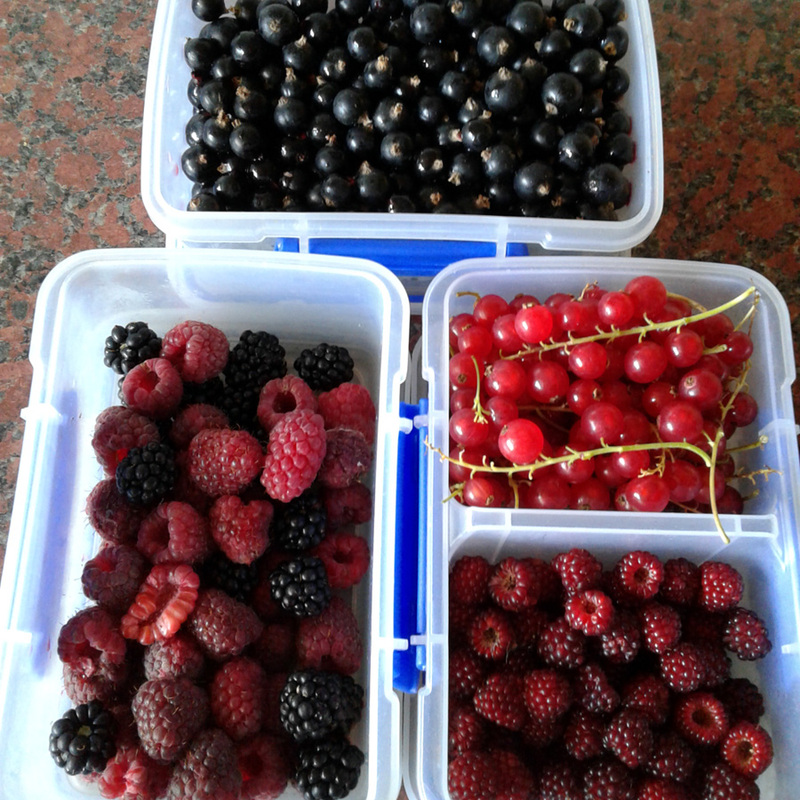 Clockwise from bottom-left: raspberries and blackberries, blackcurrants, redcurrants, Japanese Wineberries. Yum! 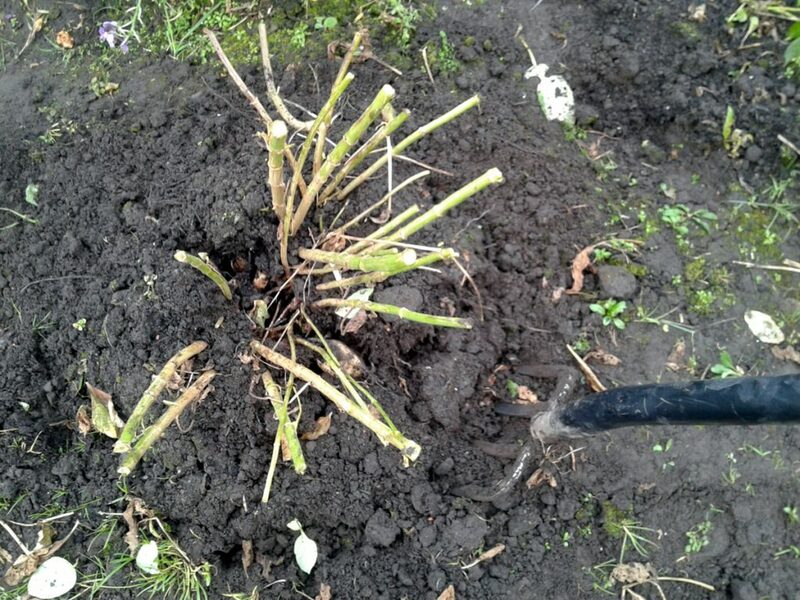 With the weather holding dry and fair last week, I took the opportunity to spend some time down at Plot #59 and make a start on of the more essential winter maintenance jobs: pruning our soft-fruit bushes. 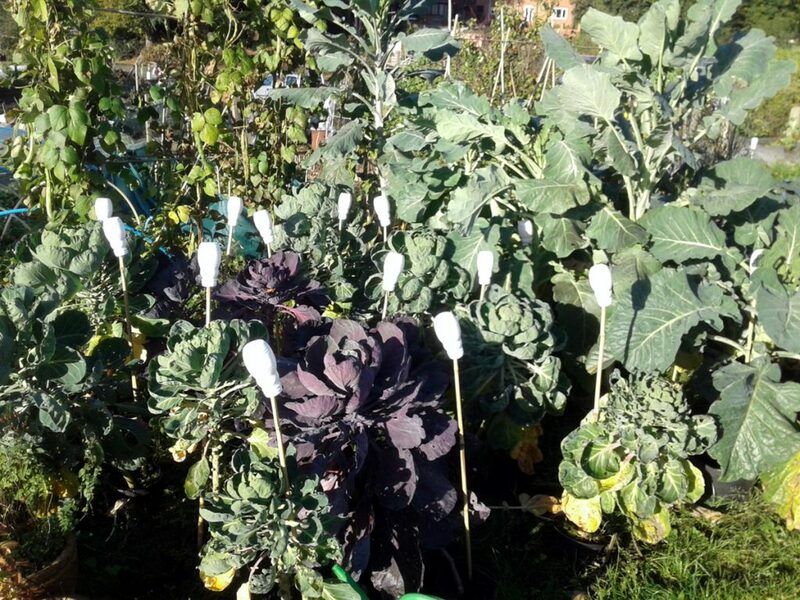 Soft-fruit crops are among the most useful you can grow on an allotment. 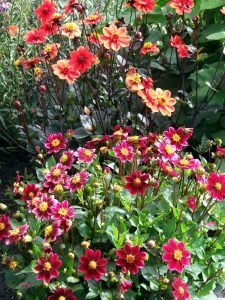 They’re perennial, so once they’re in they take very little to maintain, and count towards your area-under-cultivation score for purposes of satisfying the allotment committee’s quotas. The fruit itself is the sort of thing that’s generally classed as a ‘superfood’ (although it seems that pretty much anything fresh is going to be vitamin-packed and bloody good for you). And when you look at the shop-price of a small punnet of raspberries or blackcurrants in the shops, then think of the kilos of fruit you can pick from even a couple of bushes in a decent year, I think you’d be a bit daft not to. We have a small but highly fruitful selection so far: five gooseberry, around ten blackcurrant, a Japanese Wineberry, three redcurrant and a whitecurrant. We also have a section of assorted raspberry canes relocated from elsewhere on the plot; mostly Autumn-fruiting, one or two Summer-fruiting. We have plans to grub the raspberries up and replace them with named varieties next year, but for now they’re staying put. And we’re hoping to add a few more bushes to the section as well: one or two Jostaberries, maybe a Gojiberry, that sort of thing. Confession time: we made a bit of a noob mistake when we planted them out back at the start of our allotmenteering and the fruit bushes went in too close to each other. Now, well-established well and with conditions this year proving favourable for lots of new growth, they’re a little too closely packed for comfort. Some of them will need to be relocated, or donated to plot-neighbours. But before that stage, they all need a good winter prune. I’ve tackled the blackcurrants and gooseberries so far, going over the plants to remove any congested, crossing or damaged stems and branches. I’ll be giving them a second pass shortly, and working on the redcurrants, too, following the generally prescribed method (Carol Klein’s book Grow Your Own Fruit is a good source for general advice). Blackcurrants: Fruit on new growth. Up to the fourth year after planting, remove weak and wispy shoots to establish a framework of 6-10 strong, healthy branches. After year four, cut out about a third of the old wood at the base to make room for new growth. Continue to remove weak shoots and those leaning towards the ground. We moved the blackcurrants from elsewhere on the plot, or brought them in from home, so I’ve assumed that they’re all probably more than four years old and so have pruned accordingly. Gooseberries, Redcurrants, Whitecurrants: Fruit on old wood and at the base of new stems. Shorten leaders back by a third and sideshoots back to two buds to encourage fruiting spurs. 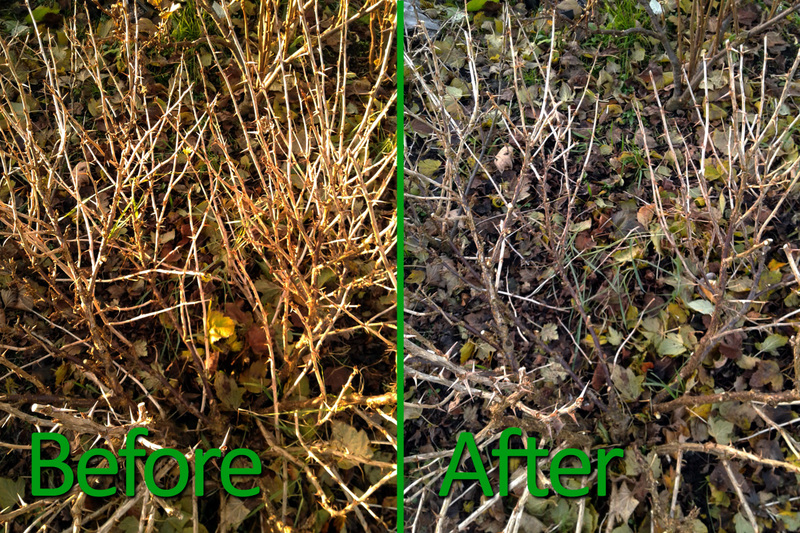 Here’s a before-and-after shot of the largest of the gooseberry bushes. A bit difficult to make out – especially with the different light levels between shots – but hopefully you’ll spot that the second pic is less congested, with a more open, goblet-shaped centre. This should hopefully allow for good ventilation when the plant is in full leaf next year, cutting down on the risk of grey mould infection, and allow plenty of light to reach the whole plant. The aim is to cut down on congestion in the centre of the bush, improving air flow and light levels. Raspberries (Autumn): Fruit on new canes. Cut down all old canes, right to the ground. Which is what I’ve done with all of ours. There’s a different pruning regime for Summer-fruiters, which fruit on one-year-old canes which need to be tied in to a support framework. Check out this short GardenersWorld.com video for useful advice from Monty Don. The Japanese Wineberry only gets a passing mention in Carol Klein’s book as a hybrid berry of interest, but I’ve read up elsewhere. 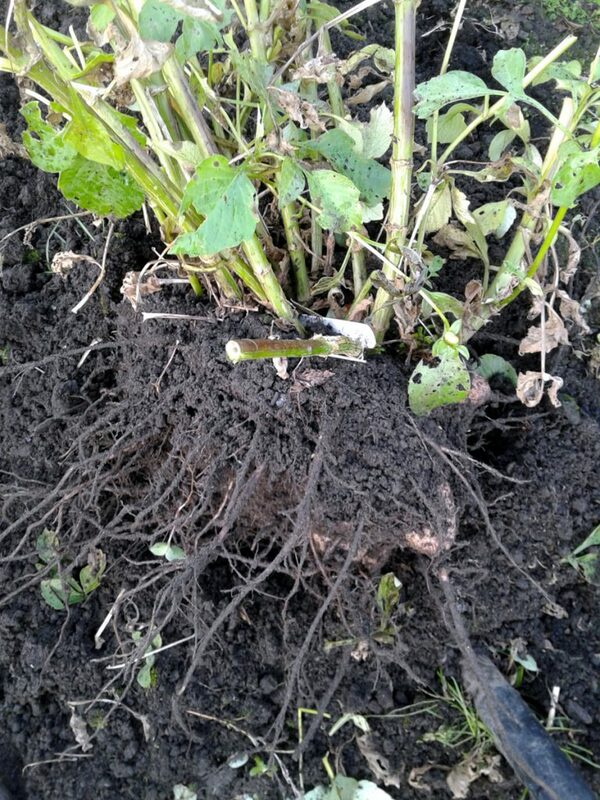 Knowing about the tip-rooting habit, I made sure that the one strong stem that grew last year from the newly-planted rootstock (which I think we bought from Beningbrough Hall NT, where they grow them in the walled garden, if I remember it right) was tied to an upright bamboo cane. This year it sprouted prolific side-shoots, all of which developed multiple clusters of delicious berry-producing blossom. After fruiting, these side-stems seemed to die right back, and so I pruned them out as they failed, leaving a single strong, upright stem and three or four smaller side-stems. We’ll see what happens next year: hopefully more of the same, and I might be able to encourage a stem or two to self-layer into pots so we can increase our stock. Blueberries: Maintain a soil pH of 5.5 or lower, using ericaceous compost or a sulphur-based amendment, and mulching with conifer clippings (a handy use for your neighbours’ chucked-out Xmas tree). For established bushes, remove 2 or 3 old stems at the base to encourage new growth and tip back vigorous new shoots to a healthy bud to encourage fruitful side-branching. These hardwood cuttings can be used for propagation purposes, too. We have two blueberry bushes growing in large pots at home. I’ll be taking a look at those this week and checking to see what needs doing with them, but as I re-potted them at the beginning of the year, I don’t think I’ll be doing anything too drastic. And that’s pretty much it, apart from the aforementioned reorganisation and relocation, followed by a good mulching with composted bark. If you’ve had success – or not so much success – with the same or different pruning and care regimes, please do feel free to share your top tips in the comments below. All feedback and advice will be very welcome indeed. 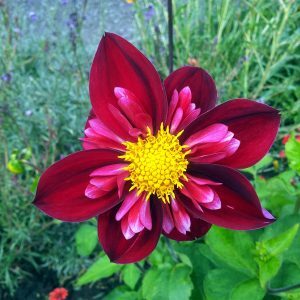 This was the first year that Jo and I have grown Dahlias and we’ve both thoroughly enjoyed the collarette varieties that we bought from J. R. G. Dahlias back in March – ‘Don Hill’, ‘Christmas Carol’, ‘Top Mix Reddy’, ‘Top Mix Mama’ and ‘Top Mix Purple’ – and the extremely lovely, deep purple-flowered ‘Esther Chamberlain’, which was a gift from Jo’s Dad, Guru Glyn. We started them off in the greenhouse in April and planted out in May. 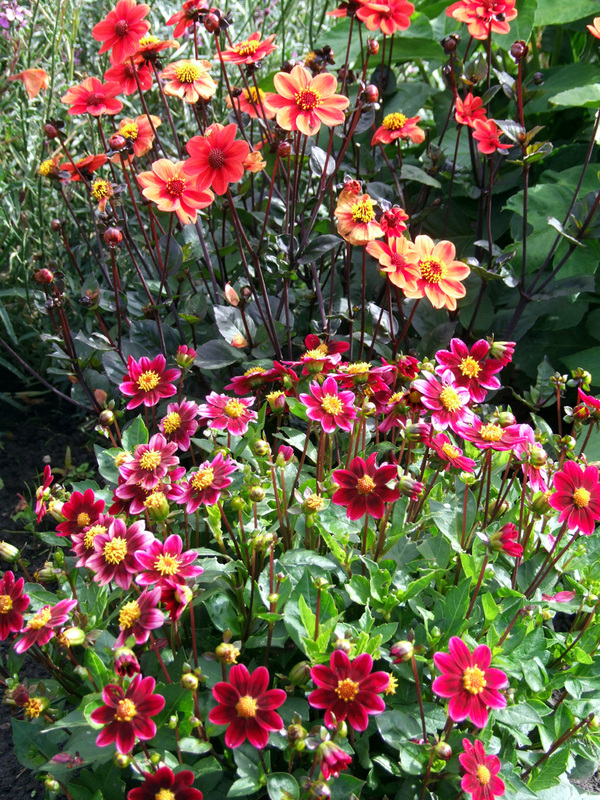 They’ve been performing incredibly well since they first flowered in early June. We’ve had an absolute riot of colour, particularly from the two larger varieties, ‘Don Hill’ and ‘Christmas Carol’, as you can see from these pics (click a thumbnail for a larger image). 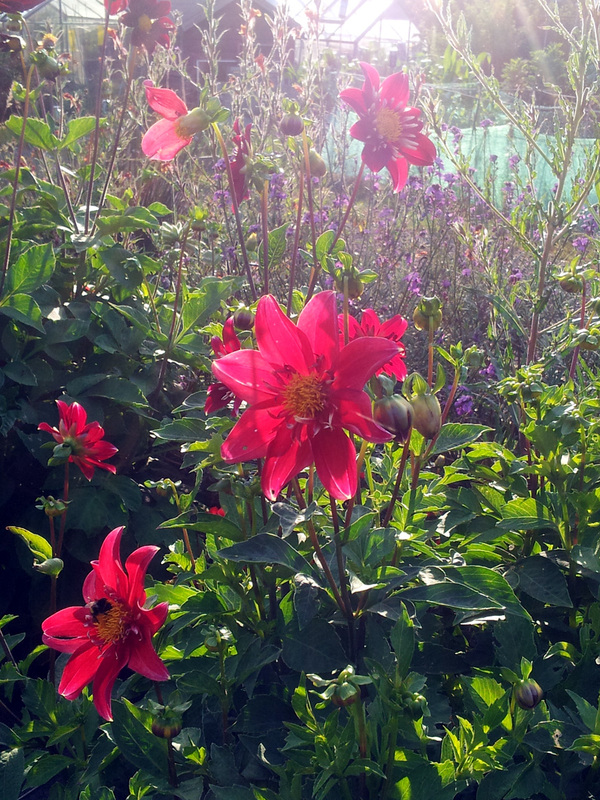 We’ve had months of glorious colour from our collarette dahlias. 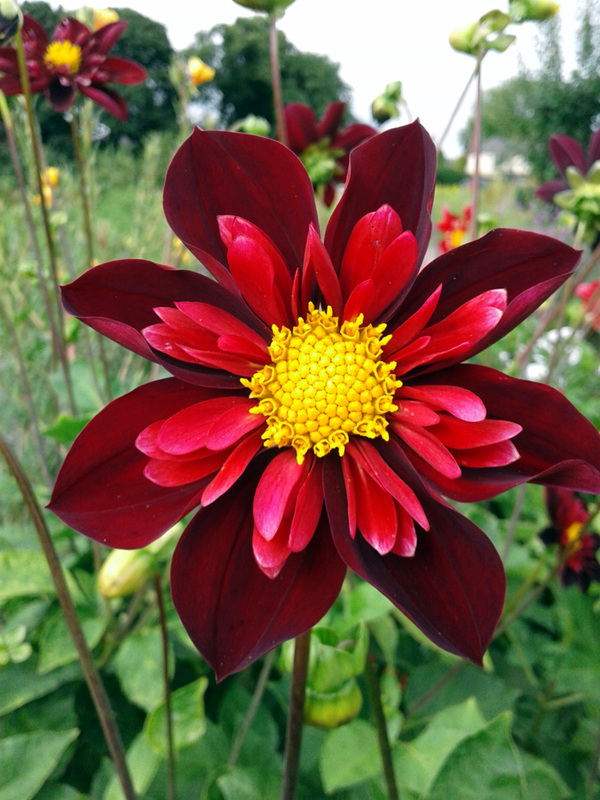 Dahlia ‘topmix purple’ has a lovely gradation of colour from deep burgundy to almost-pink. 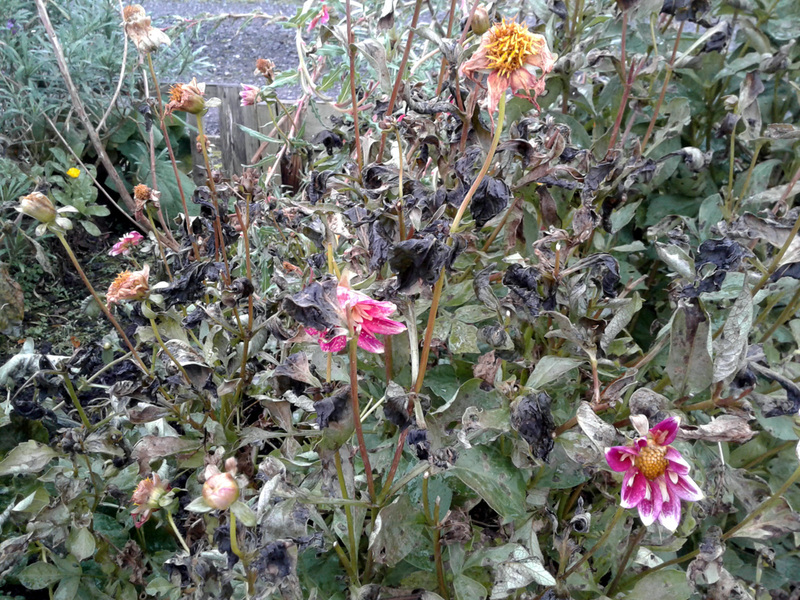 But the first hard frost of the year hit us last week and we knew that the time had come for these Mexican beauties to die back. 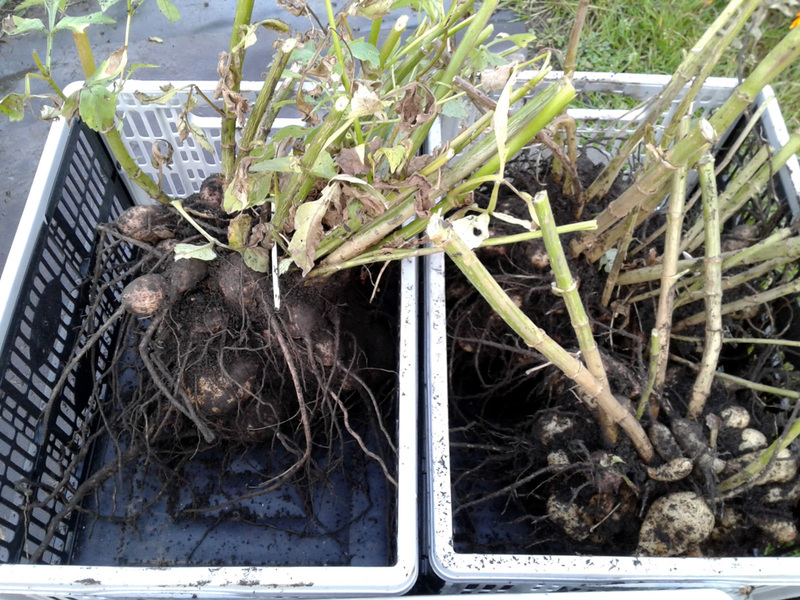 So at the weekend, Jo and I nipped down to Plot #59 to lift the tubers and prepare them for storage. Our dahlias were definitely looking sorry for themselves when we arrived. 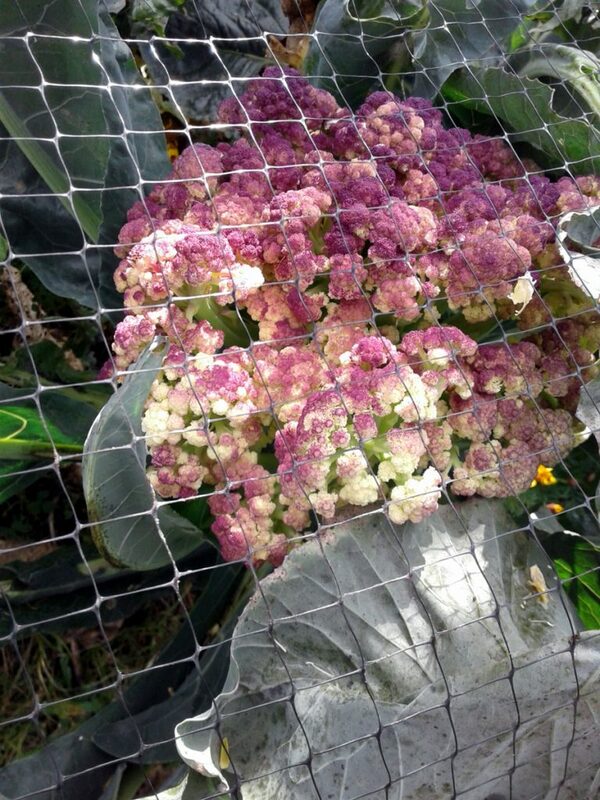 In close-up, you can see the extent of the damage: blackened foliage, dead flowers. 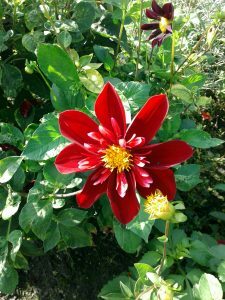 After compiling notes gathered from various sources – Guru Glyn, Jack Gott’s website, Monty Don on Gardener’s World – here’s how we went about the job. If you spot anything amiss, or can think of a better method that we could employ or apply next year, please do shout out in the comments, down below. 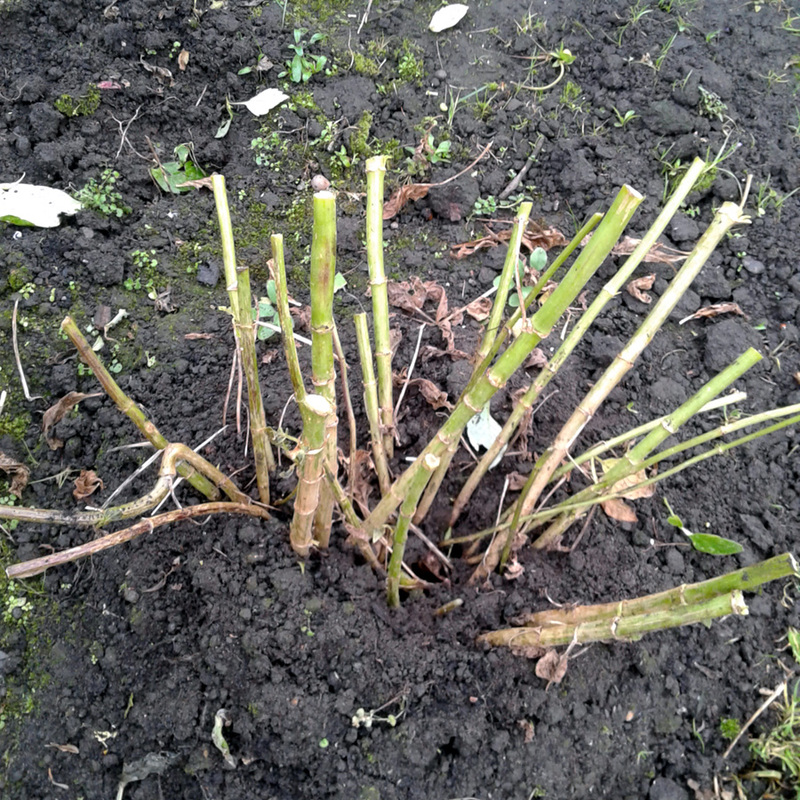 All the dead and dying foliage is cut back to around 15cm of stem. After gently loosening the soil, the entire plant is lifted out of the ground. The plants have been carefully lifted and are ready to be cleaned up a bit. 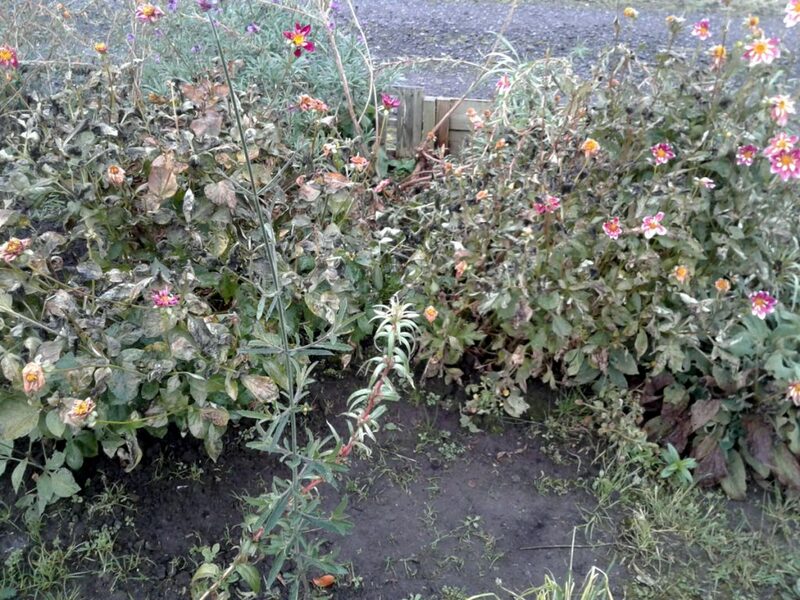 We brushed off as much of the loose soil as possible – no point taking half the allotment back home with us. The trimmed and lifted plants are crated up and ready to transport back home. 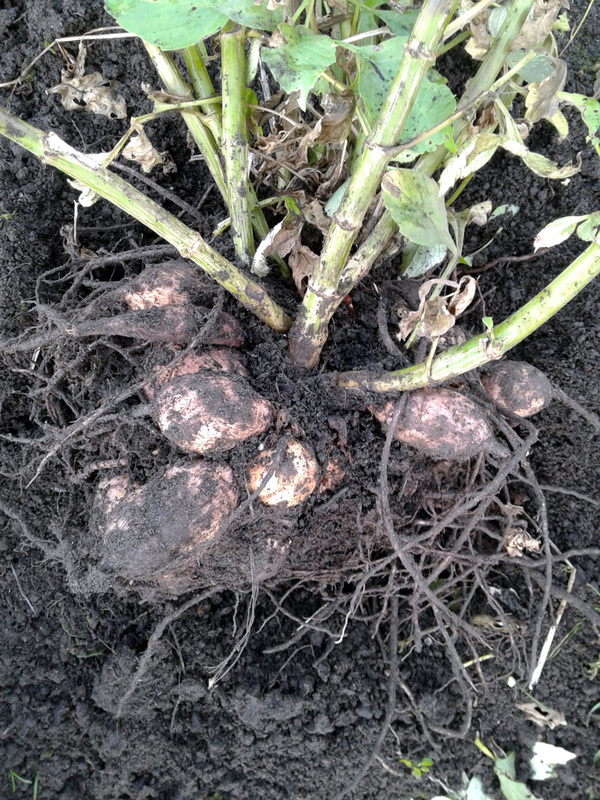 The next job will be to wash off any remaining soil and then thoroughly dry the tubers. Standing the plants upside-down on their stems for a few days will make sure that all the moisture drains out of the stems and doesn’t soak the tubers instead. Back home in the greenhouse, ready for drying out before packing and storing. The last stage will be to pack them in used compost (or I think we could use a compost / perlite mix) for over-winter storage in a cool, dark place. We have an old bedside table or two in the shed with good, deep drawers that should be ideal for the purpose. We’ll give them a check-over every fortnight to make sure there are no signs of rot. 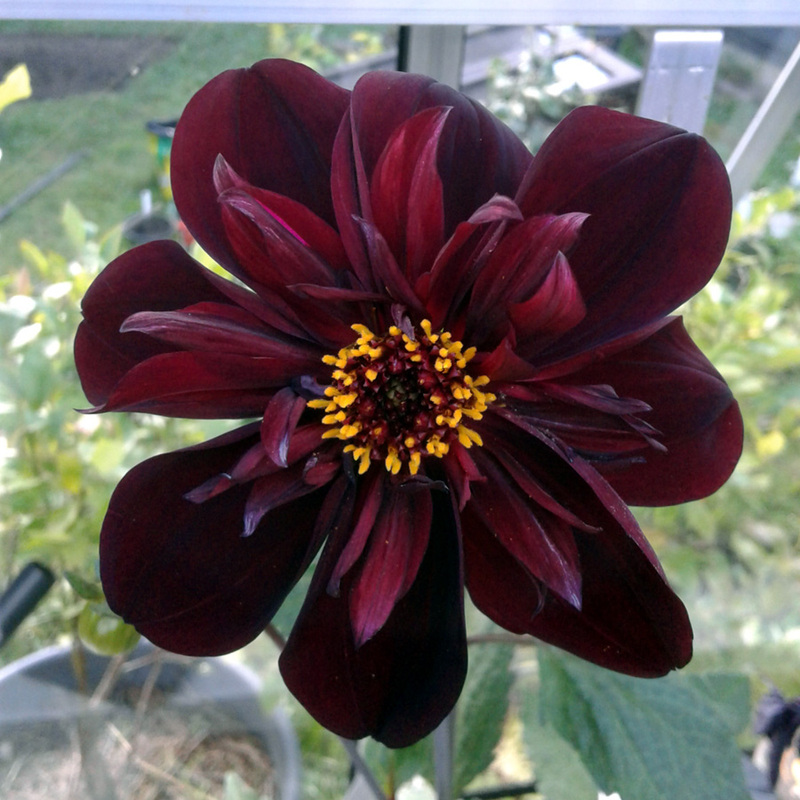 Assuming all goes well, in four months’ time or so they’ll be ready for potting up in the greenhouse and encouraging back to life for another stunning display next Summer and Autumn. Of course, now Jo and I have been bitten by the Dahlia bug, the trick will be to avoid buying too many new varieties to add to our selection. But then, when does one more Dahlia tuber become a Dahlia tuber too many? We’ll leave you to ponder on that little bit of horticultural philosophy. 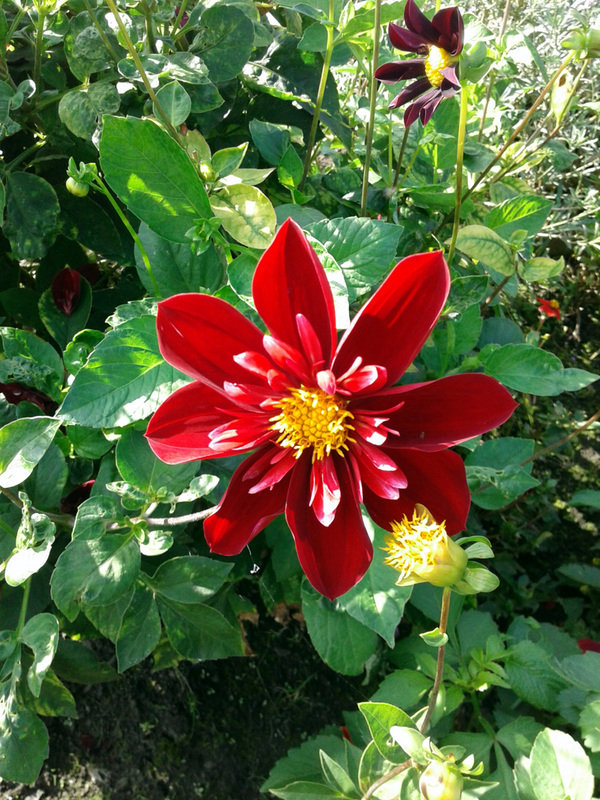 If you’ve grown Dahlias this year, please feel free to share your pics on Twitter @nftallotment. We’d love to see them! October was another mild month – the ongoing legacy of the El Niño phase of the ocean temperatures in the Southern Pacific earlier this year, most likely – which meant we were able to put in a fair few sessions down on Plot #59. As per my latest Harvest Monday post, the Autumn fruit and veg has been in full swing. We’ve had cabbages, kale, squash, leeks, mooli, scorzonera, salsify, turnip, swede, chillis (back home in the greenhouse) and, to take the savoury edge off, lots and lots of raspberries. Speaking of squash, I swapped one of our Cucurbita maxima ‘Turk’s Turban’ for a plot-buddy’s Cucurbita maxima ‘Crown Prince’, and baked half of each last Sunday. A tale of two squash: The Crown Prince and the Turk’s Turban. After about 40-45 mins in a reasonably hot oven (around 200oC) they were both delicious; rich, creamy orange flesh with some lovely caramelised bits on the cut-side. Jo and I agreed that the Turk’s Turban was ever-so slightly sweeter, but the Crown Prince had a slightly smoother texture and consistency. We’ve since eaten the other half of the ‘Crown Prince’, steamed and added to a risotto, and it was very tasty again. I’ll be growing both again next year, all being well. 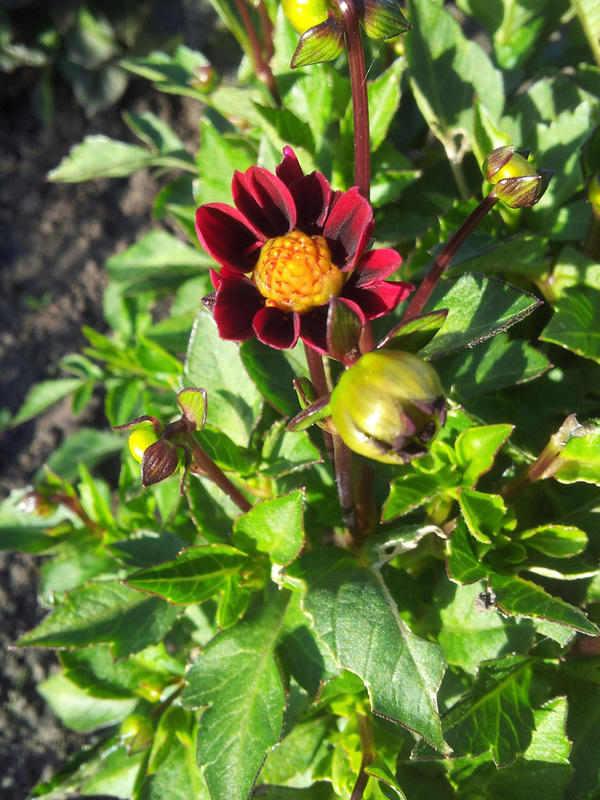 I’ll need to buy some ‘Crown Prince’ seed though; I’ve saved seed from the one we ate, but as C.P. is an F1 hybrid and squash cross-breed quite readily anyhow, it’s guaranteed that any offspring won’t be true-to-cultivar. 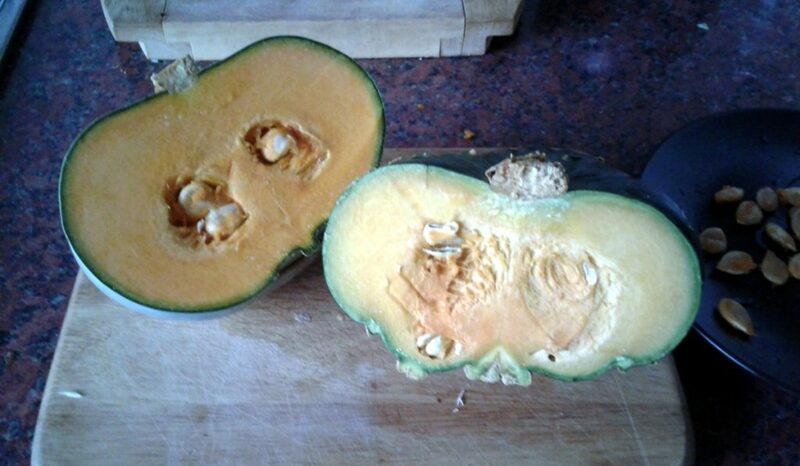 But who knows, my Cucurbita maxima ‘Crown Prince X’ might end up being even more delicious than its sire. It’s worth a shot. 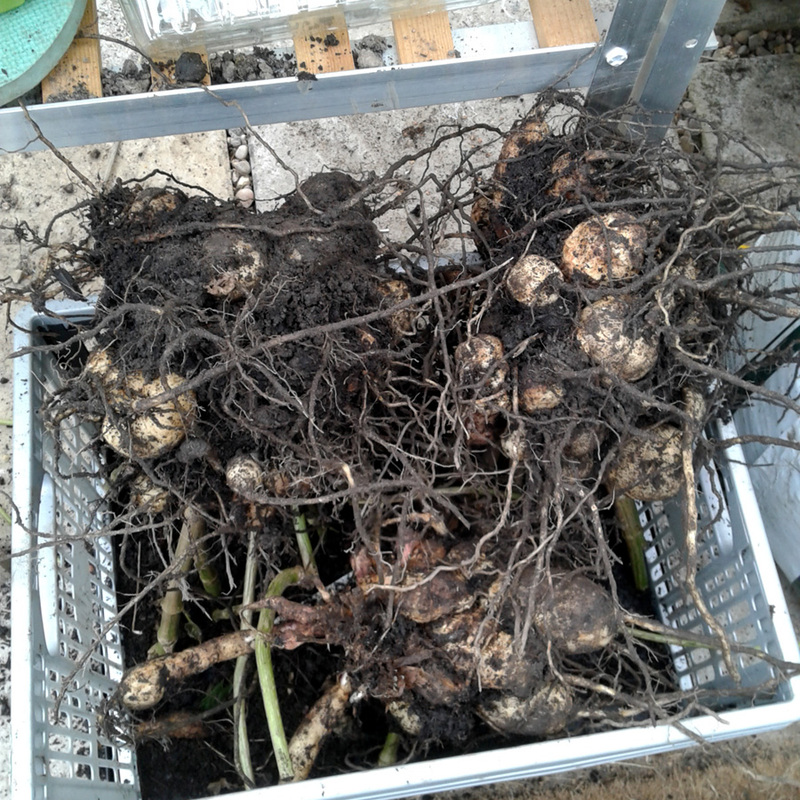 We have a few tasty roots still to pull: carrots (hopefully), scorzonera, salsify and Hamburg parsley, all being well. 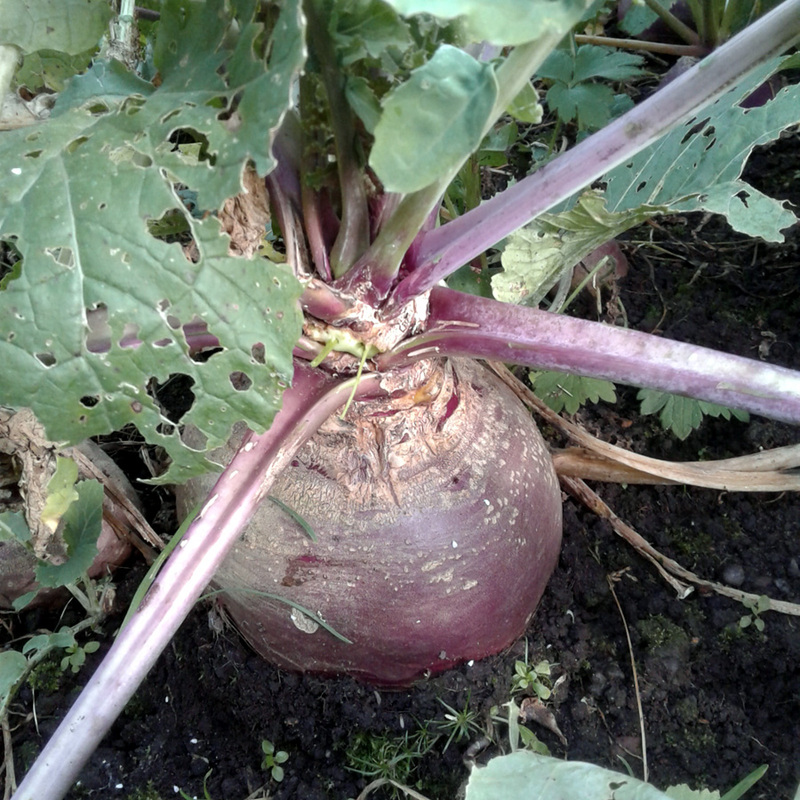 We have a few decent-sized Brassica napus swedes to look forward to adding to our Autumn stews and mashes. 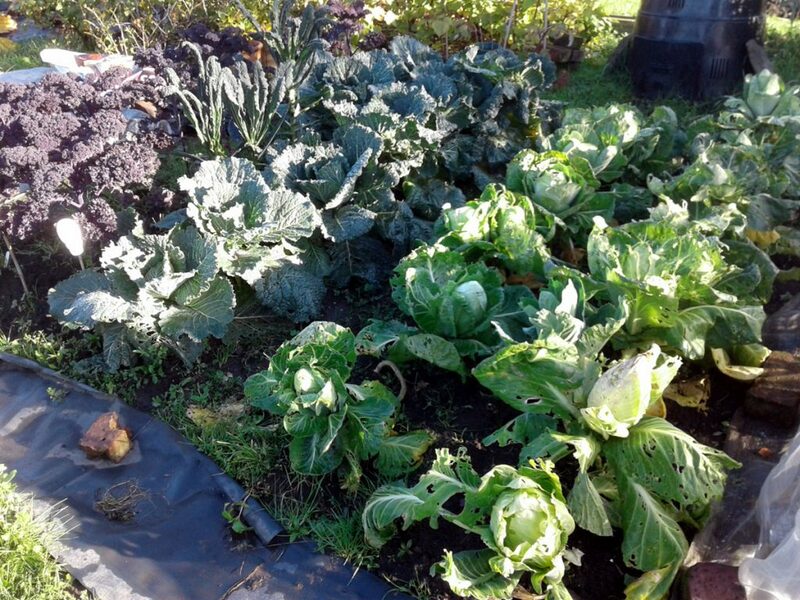 Our cabbage patch went in late but has caught up nicely and is eating very well indeed. 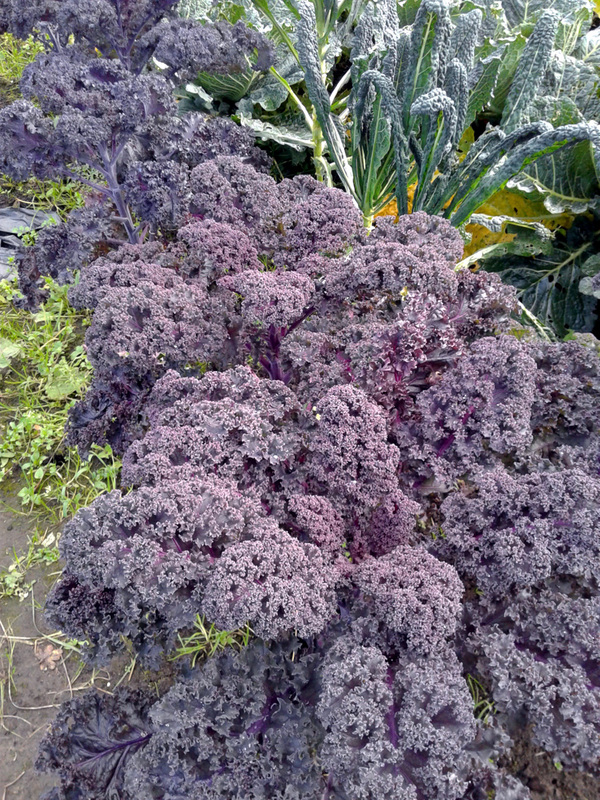 Kale ‘redbor’ and ‘cavollo nero’ are both growing – and eating – very well, too. A few of our sprouts are afflicted by club root, but we’re hoping we’ll have a decent crop for our Yuletide dinner. 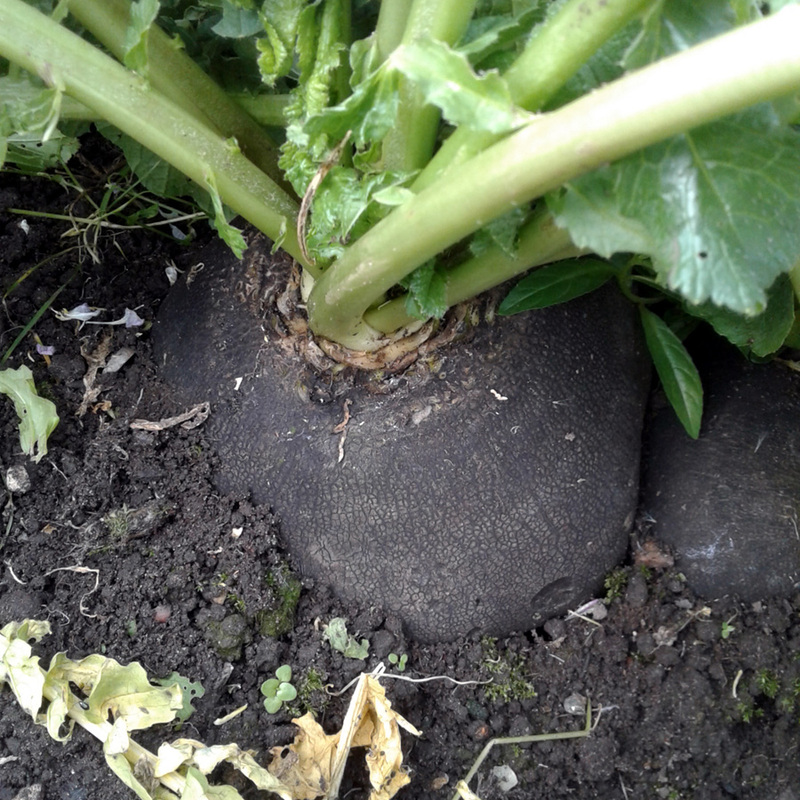 I think I’m giving up on growing caulis next year – they always seem to bolt before I can get them cut and eaten. Not too shabby. 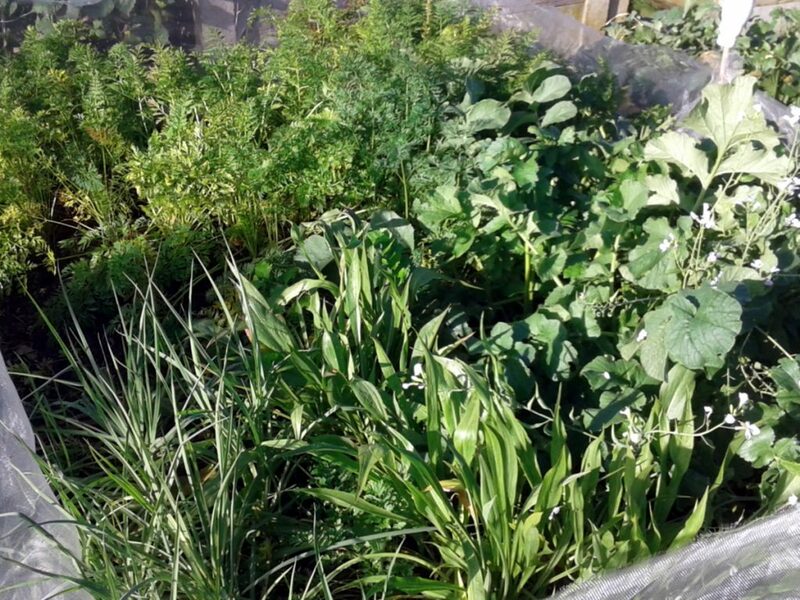 Not as much winter veg as I’d hoped to have in the ground by now, but this year has been busier than anticipated in the back garden landscaping department, so I haven’t had as much time as I’d hoped for successional and winter seed sowing. Next year. Definitely. We had the first hard frost earlier this week, so I expect that when we head down to the plot later today we’ll find the dahlias foliage blackened and the tubers in need of lifting for storage over the winter. They’ve been doing astonishingly well until now, though and even as the temperatures have started to dip, their bright reds have provided a welcome splash of colour at the front of the plot. Elsewhere we’re still getting cheery colour from Erysimum ‘Bowles’s mauve’ (wallflower), Verbena bonariensis, Tagetes(marigold), Centaurea cyanus (cornflower), Oenothera fruticosa (evening primrose), Rudbeckia and a few others. 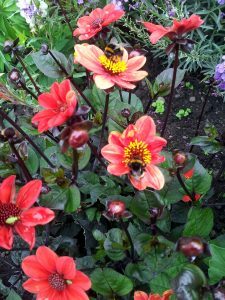 And I know Jo is already planning ahead for next year, when the riot of colour will be a joy to behold and the bees, butterflies, hoverflies (and other members of the ever-welcome Union of Associated Pollinating Insects) will be utterly spoilt for choice. 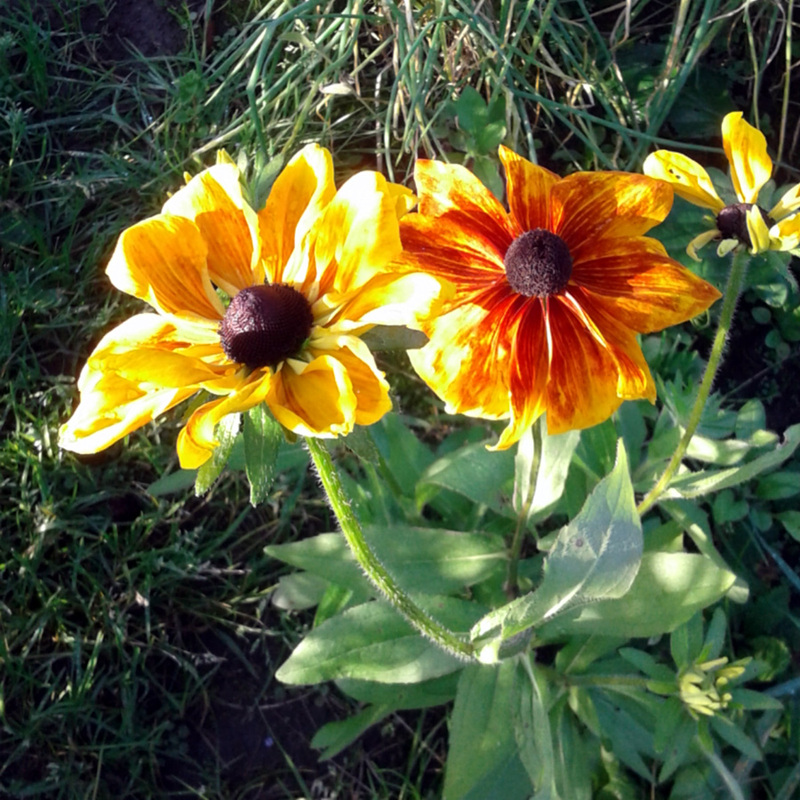 Jo’s Rudbeckia are still brightening up the plot with splashes of gold and bronze. 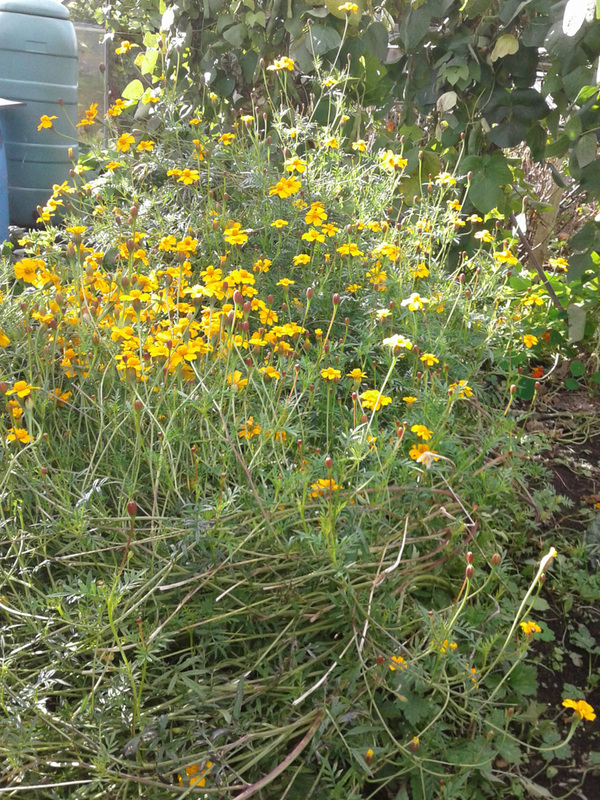 The two small Tagetes plants we added to the courgette patch have taken over since the dead courgettes were removed. 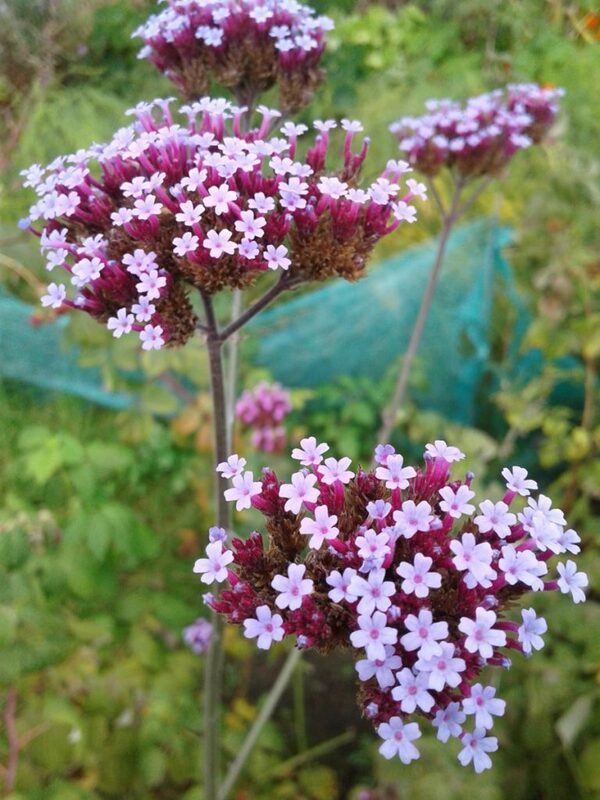 We grow Verbena bonariensis mainly as a bee lure among raspberries, but it’s very lovely indeed in its own right. Most of the work this month, rather inevitably, has involved clearing away summer crop residues, tidying up winter crops, the inevitable ongoing weeding, and working on the central path; the long-awaited first thing we put on the to-do list when we took the plot on back in January 2014. It’s been slow going, as per my recent Hard Slog: Man vs. Midden post. The plan is to roughly level it off and lay weed membrane down for now. Over the winter I’ll start moving the flags that we’ve currently loosely laid at the back of the plot down to the front, and then when we have our driveway at home re-done – next Summer, most likely, after the back garden hard landscaping has been finished – we’ll recycle the old flags from the current drive and extend the path right down to the back of the plot. That’s the plan, anyhow. We’ll see how it goes. That’s it for October, then, and November is already bringing colder nights and, since the clocks went back last weekend, darker ones, too. 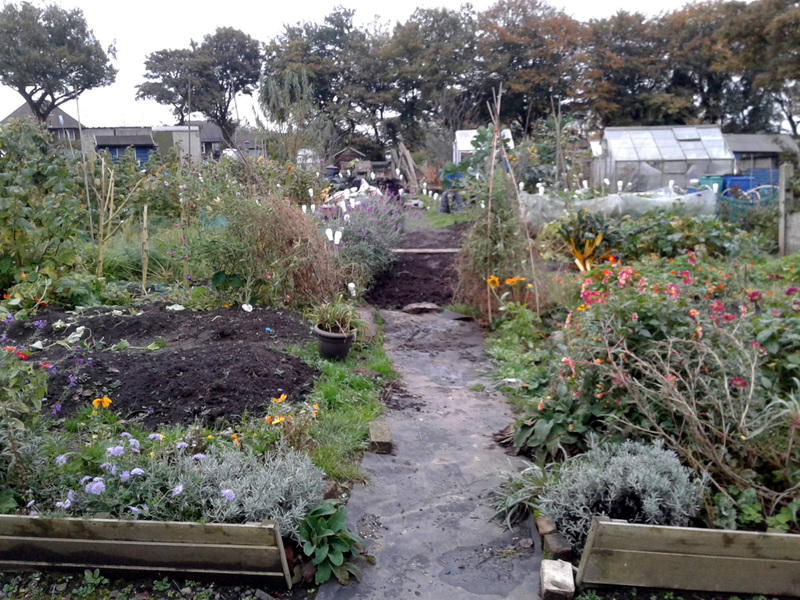 Here’s hoping the rain isn’t too torrential and we can get down the plot to carry on digging and weeding as much as possible. Fingers crossed.